In late 2005, PowerShares launched an ETF (ticker symbol: PRF) based on a controversial new “index” known as the Research Affiliates Fundamental 1000 Index (RAFI 1000). We now have over 5 years of return data for this fund, and this seems to me to be enough data for us to take a preliminary look at the strategy’s performance. A quick comparison of PRF against popular traditional index funds such as SPY and VTI is shown below. 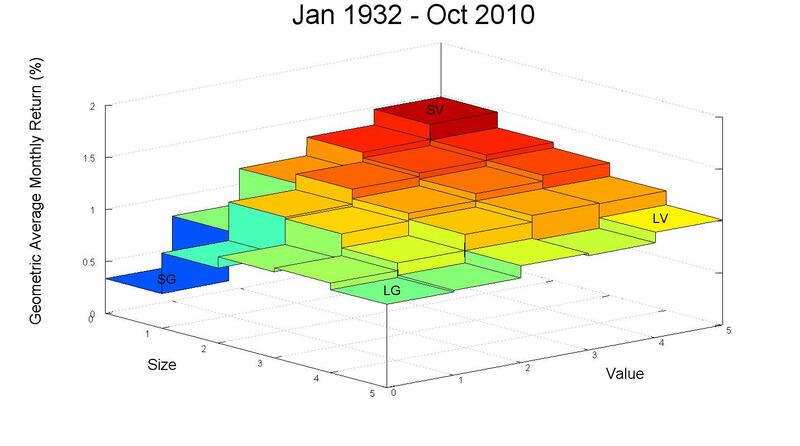 This plot shows total returns (including dividends). 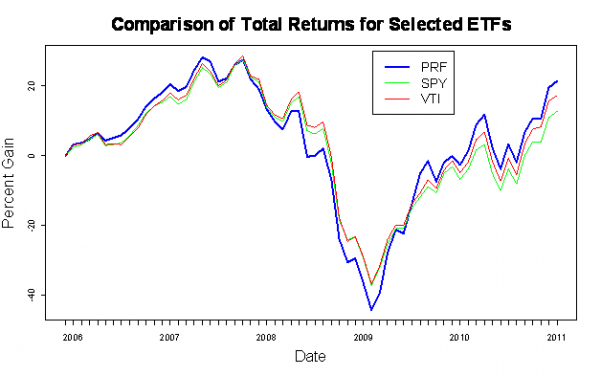 This graph shows that PRF has outperformed both SPY and VTI over the past 5 years, but it also experienced a larger drop during the crisis of 2008 and 2009. To properly evaluate the performance of PRF, we need adjust the returns for risk using an asset pricing model such as the Fama-French Three Factor Model (FF3F). However, before I get to the detailed analysis, I’d like to review what Fundamental Indexing is and why it is controversial. 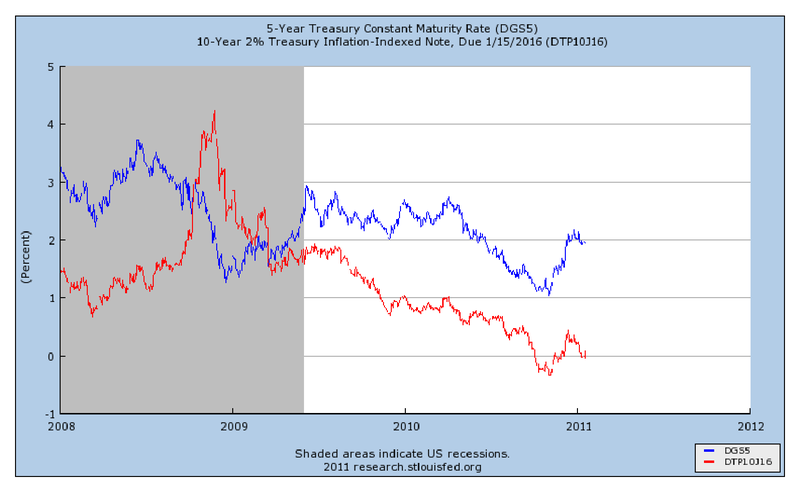 How well can the small-value premium be captured using ETFs? In a previous post, I plotted the returns of 25 portfolios which were formed by sorting stocks on both size and value characteristics. The data, from the Kenneth French website, showed a clear pattern of increasing returns as size decreased and value (measured by book-to-market ratio) increased. In other words, the small-value portfolio had outperformed the broader market over most periods of 20 years or more, and the margin of outperformance was often quite large. Fama and French, who built the size and value effects into an asset pricing model, believe that the higher returns of small stocks and value stocks are related to the higher risks associated with holding these stocks. This may be true, and there is some persuasive evidence supporting the Fama-French viewpoint. However, another issue with capturing the small-value premium is cost. The returns of the Fama-French 25 portfolios do not include trading costs, fees, or taxes, and these costs are likely to be higher for investors who are trying to implement a small-value tilt in their personal portfolio. In this post, I will evaluate several ETFs which track popular indexes and calculate how well these funds capture the theoretical returns predicted by the Fama-French model. In addition, I will place the factor loadings of these funds in the context of the Fama-French 25 portfolios. For example, does a fund which is described as a “small-value” fund really behave similarly to the most extreme small-value portfolio from the Fama-French 25 portfolios? If not, which of the portfolios does it approximate most closely? 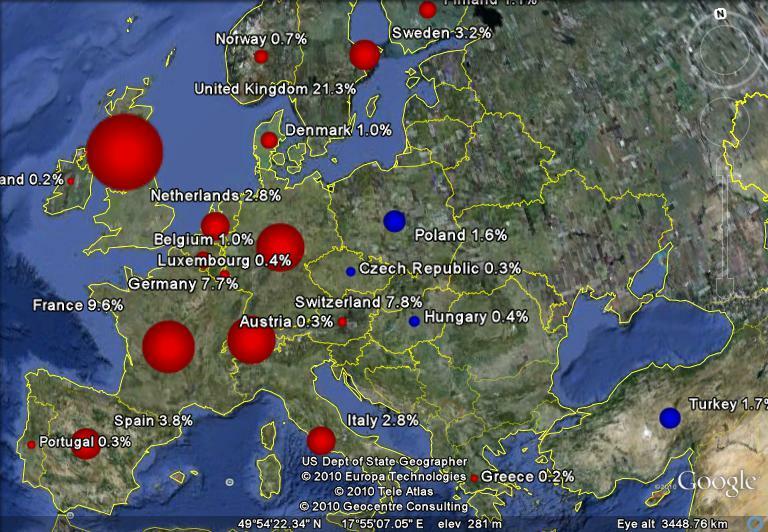 Google Earth is a great tool for looking at many different types of data. A quick Google search will show hundreds of on-line Google Earth projects which use the tool to display data on everything from the health of marine ecosystems to the status of U.S. airline flights. I’ve put together a Python script to display the country weights for two international ETFs; EFA is an iShares ETF which tracks the MSCI EAFE index, and VWO is a Vanguard ETF which tracks the MSCI Emerging Markets index. I used red placemarks for EFA and blue for VWO. In both cases, the area of the placemark is proportional to the country’s weight in the respective fund. These weights vary over time with a country’s market cap, so each country weight shown is for a particular date (9/30/2010 for EFA and 11/30/2010 for VWO). What is the proper way to calculate investment returns? Unfortunately, the answer is somewhat complicated. The two most frequently used methodologies are the “money-weighted” and “time-weighted” methods. In addition, an approximation of the money-weighted method, known as the “Modified-Dietz” method, is also commonly used. These three methods can sometimes give very different results. The “correct” calculation method to use will depend on how you plan to use the results. My objective in this post is to compare the three common return measures: the money-weighted return, the time-weighted return, and the Modified-Dietz return. I will provide examples of how these measures can differ and explain when each should be used.